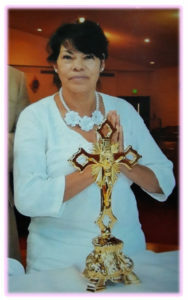 Ma Dalia Martinez-Garza, age 59, passed away on Wednesday, January 23, 2019. A visitation will be held in the chapel of Charter Funeral Home on Sunday, January 27, 2019 from 2:00 p.m. – 4:00 p.m. A funeral service will follow immediately after, also in the chapel of Charter Funeral Home. Ma Dalia, your sons and grandsons love you forever. Tus hijos y nietos te amamos para siempre.